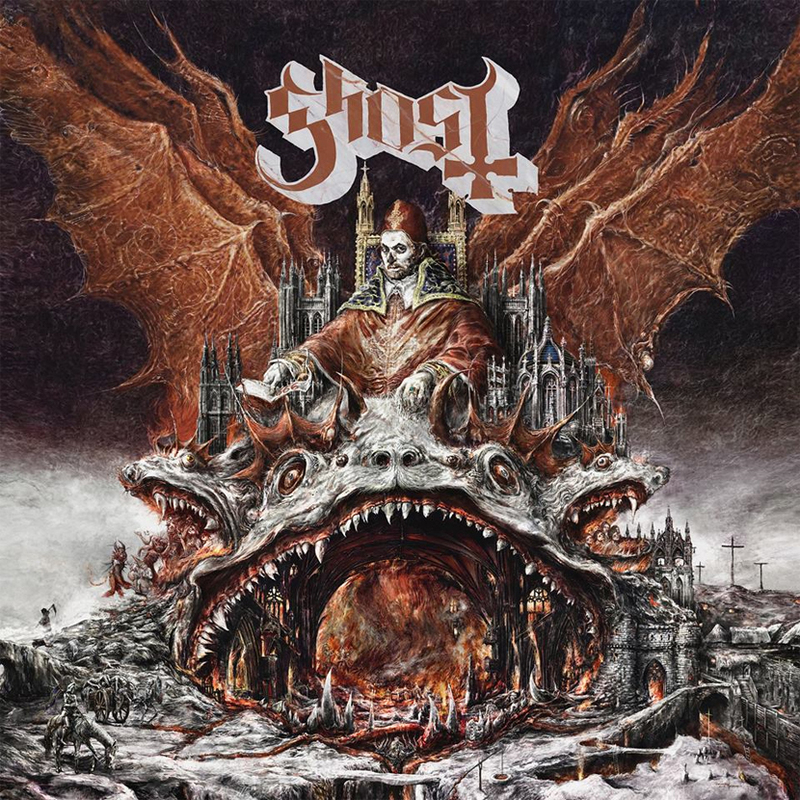 After an ugly lawsuit between current and former members, Swedish metal band Ghost have returned with their fourth LP Prequelle, and the results are, well, underwhelming. Feeling less like a fresh set of new songs and more like a plate of leftovers from Meloria (their killer 2015 album), Prequelle pretty much explores the same sonic territory but lacks the instant throat-grab of songs like "He Is" and "Cirice." Where Meloria and its 2013 predecessor Infestessumam (my personal favorite Ghost record) were chock full of excellent 70s and 80s-esque hard rock that channeled bands like Blue Oyster Cult and even (gasp!) ABBA, Prequelle is just a slate of competently written and performed tunes that satisfy without dazzling. Even minor standouts like the glam metalish "Rats" and "Dance Macabre" and the intriguing but incomplete-sounding closer "Life Eternal," with its numerous key modulations and emotive hook, sound like B-side material rather than album highlights. The choice to put two full-length instrumentals on one record strikes me as odd too - the second of these, an atmospheric waltz called "Helvetesfonster," keeps my attention at least, but the first, called "Miasma," feels like a song for which they just couldn't come up with a vocal part (though I did like the use of saxophone toward the end). Couple that with the truncated intro track "Ashes," and you're left with only seven songs that feature the band's frontman and primary creative force. That's not to say Prequelle doesn't sound great, it certainly does. The slick, full-sounding production on Meloria is back on this album; the instruments all sound huge and thunderous, and Cardinal Copia's dense vocal harmonies provide plenty of ear candy as usual. It's just that the prodigious songwriting of the last two records is missing here. I don't hate any of these tunes, but I don't love any of them either. Prequelle is a decent effort, but unlike Infestessumam and Meloria, sadly doesn't feel like an essential Ghost record. I give the album *** out of *****.